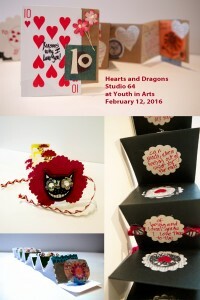 “Hearts and Dragons” for the New Year and Valentine’s Day! Join Fran Halperin from Studio 64 and Youth in Arts for an evening of art-making for all ages to celebrate the Lunar New Year and get ready for Valentine’s Day. Children and adults alike are invited to create personalized “Heart” or “Dragon” accordion books using quality art materials and traditional bookmaking techniques. Kids can join YIA Mentor Artists from 4 to 6, while adults work from 5 to 7 with Studio 64. That means from 5-6 pm the whole family can be engaged in a fun and creative project! Space is limited–we encourage you to get online tickets in advance (no online ticketing fee). Drop-ins will be able to pay onsite only if space is available. This project is best for children grades 3 and above.